My fiance is a chef, so that is the reason for the "recipe/restaurant" theme. I found a typewriter font and mocked an index card-style recipe, and set-up the letter-size document for two on a page (final size 5" x 7"). I printed them on 130 lb. 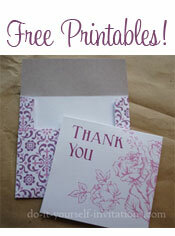 card stock paper from Paper Presentation (http://www.paperpresentation.com). 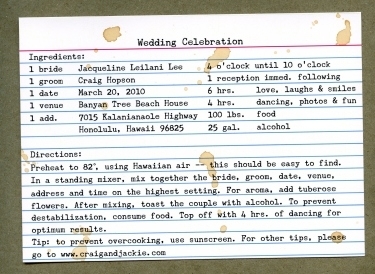 After printing, I made black tea to create the "stains" and and aggressively whipped a tea-doused chopstick at the invitations. 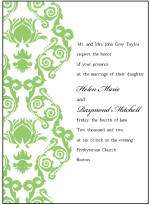 Once dried, I cut them with an arm paper cutter (my favorite wheel cutters at Kinko's unfortunately could not handle the thickness and left my invites with ugly, rattled edges). 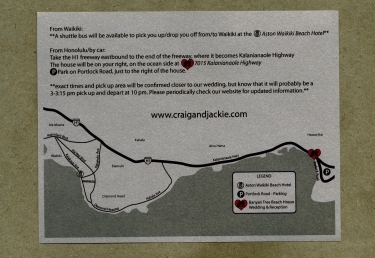 The wedding map was created with Adobe Illustrator and Google Maps. I Google mapped the area required and traced all the necessary roads. I printed the maps, 4 to a page, on metallic paper from Paper Presentation.